The Tipsy Baker: A room without a book is like a body with out a soul? A room without a book is like a body with out a soul? "It was hotter than ever now and everyone was thirsty." *Burmese Days by George Orwell. Depressing novel about colonialism, unrequited love, self-loathing, and heat. "The way I see it, if we are remotely serious in our commitment to eat less meat and fish, we will want to make plenty of meals -- perhaps even the majority of them -- completely without meat and fish." *River Cottage Veg Everyday by Hugh Fearnley-Whittingstall. I've been trying to cook through the estimable River Cottage Veg Everyday and it's been a struggle. Uncle. There's simply not enough in here that I can feed the picky eaters with whom I live. Fearnley-Whittingstall: "I'm trying to change your life here. The object of the exercise is to persuade you to eat more vegetables. Many more vegetables. And I hope to do so not by shouting from a soapbox, but through sheer temptation. . . "
Does kohlrabi carpaccio qualify as "sheer temptation?" A salad of shredded raw parsnips, cabbage, and dates? Beetroot pizza? Even I quail at kohlrabi carpaccio and there's no way Mark or Owen would touch roughly 85% of this dishes in this worthy book and I'm giving up. Having said that, I succeeded with almost everything I tried, starting with the brussels sprouts salad I've already written about. The book also contains the easiest recipe I've ever found for vegetable stock, though you do need a food processor. Heat 1 tablespoon oil in big pot while you grate 2 onions, 4 carrots, 4 sticks celery, and a few cloves garlic in your machine. Scrape vegetable shreds into the pot and cook for a few minutes. Pour in 2 quarts hot water, bring to a boil, and simmer for 15 minutes. Strain. Done. I've used this to make a number of Fearnley-Whittingstall's soups (very strong, the soup chapter) and they've all been terrific, though the curried sweet potato soup was a bit too sweet. Mark likened it to "warm honey." I should add that Isabel and I both fell passionately and briefly in love with Fearnley-Whittingstall's carrot hummus. Roast carrots with honey, cumin, and coriander, then puree with tahini and citrus juice. This hummus was fantastic on day #1 and quite tasty on day #2, but on day #3 the flavors had begun to fade and I looked at my little mound of carrot mash and thought: Gerber's. Spell was broken. Isabel told me she went through a similar infatuation/disillusionment cycle with carrot hummus. If you’re curious, the recipe is here and I do recommend it, though I've done a pretty poor sales job, haven't I. Verdict: Assess your lifestyle and the tastes of the people for whom you cook and decide whether this book makes sense for you. "In the Swedish kitchen you can never be afraid of butter." *Fika: The Art of the Swedish Coffee Break by Anna Brones and Johanna Kindvall. It should be clear by now that I'm a fool for Fika. Love! The recipes for sticky chocolate cake and almond tart underperformed, but the buttercup-yellow coconut macaroons were delicious, along with just about everything else I baked from the adorable little volume. 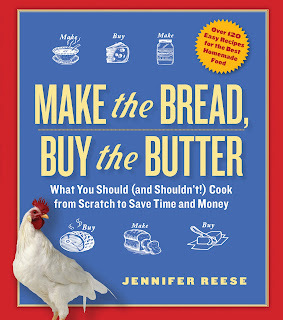 Sadly, I'm running out of recipes to try and it is time to move on to a new baking book. "Chuck Norris's tears cure cancer. Too bad he has never cried." *The Truth About Chuck Norris by Ian Spector. Along with his dirty socks and empty cereal bowls, Owen's "literature" can be found strewn around every room of this house. 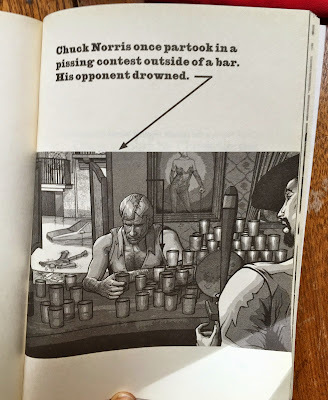 The other day, I wearily picked up a copy of The Truth About Chuck Norris to throw into his bedroom, then paused to take a peek inside what looked like an unusually cruddy book. Twenty minutes later I was sitting on the stairs in stitches, as people used to say. The Truth was published in 2007 and it's been quite a phenomenon, so if you're hip you've probably heard of it already, but if you haven't, now you have and you are very welcome! The Truth About Chuck Norris is filthy, sophomoric, offensive, absurd, and hilarious. Well, to some of us. Verdict: Do you find that even slightly funny? This book belongs in your library. Well, yes, it's hilarious, esp. with the illustration. The remark about Chuck's tears is even funnier. But I have standards, and I am not buying this book-like object. I did, however, check to see if it were in the stacks at the Oakland Public Library, which apparently also has standards. But I CAN get this through interlibrary loan, although the Sacramento public library is the ONLY Link+ member who owns it. I already own Burmese Days, have read it (ages ago, but still), and as far as I can recall, I liked it. But your nickel summary seems pretty accurate. One does not turn to Orwell for knee-slappin' hi-jinksy entertainment. Your kids have been fed any number of challenging dishes, and the thing that stops you dead in your tracks is a kohlrabi? Does.Not.Compute. Kohlrabi carpaccio didn't really stop me dead in my tracks, it just doesn't tempt me at all. Yeah, the Chuck Norris book is indeed a "book-like object." I think I might be starved for humor. Is it weird that I think the Orwell sounds good? P.S. Beetroot pizza sounds terrible. The Orwell was sort of good -- I had no trouble reading it -- but there are so many better books out there. His characters are all static; you know they'll remain true to their initial thumbnail descriptions to the bitter end. Doesn't "beetroot" sound worse than "beet?" A penny is about right! 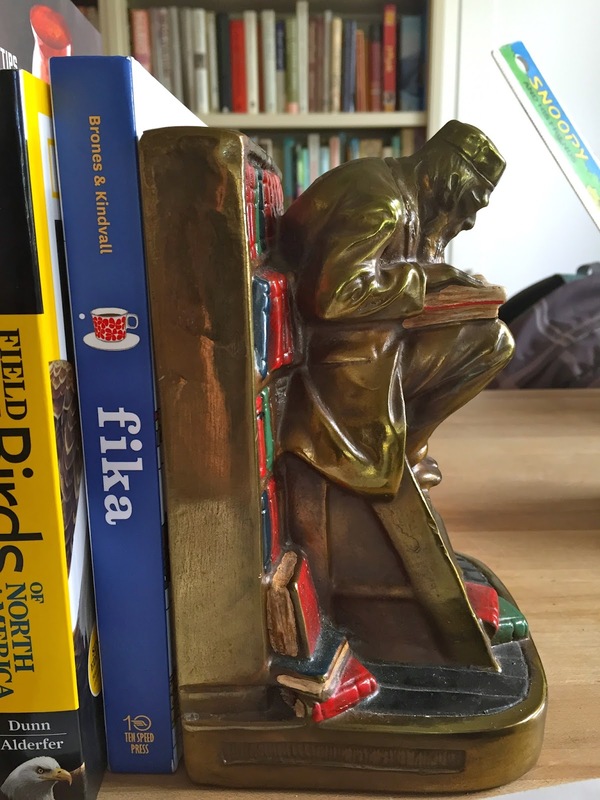 I bought Fika to give to a friend of mine and may have to get my own copy; it really is delightful. I've been reading this wonderful graphic novel, "The Thrilling Adventures of Lovelace and Babbage" by Sydney Padua, which is an astonishingly well-researched and truly delightful tale of Ada Lovelace and Charles Babbage, who managed to invent the world's first supercomputer in Victorian England. It has endnotes and footnotes and asides and all kinds of great stuff crammed in there to delight geeks like me, plus it's fun. One of my favorite things about it may very well be that Padua clearly had such a good time writing and drawing it, and that she loves Lovelace and Babbage and the really odd cast of characters they managed to surround themselves with. I like kohlrabi and beets and those dishes sound, um, not tasty. Thanks so much for those book suggestions. I'm writing them both down. I love graphic novels and always need gift ideas for my niece. You love graphic novels? Can I suggest Over Easy by Mimi Pond? It's a coming of age tale set in Oakland during the late 70's and it is wonderful. I've been a big fan of Mimi's ever since reading her collection of cartoons called "The Secrets of the Powder Room: What Every Man Should Know about Women" in the early 80's. It remains my gold standard of funny, so if you are starved for humor it might fill the gap. I remember reading Orwell's Down and Out in Paris and London and really enjoying it, but I was living in Paris at the time. Over Easy is a GREAT book! Also, Roz Chast's book about her parents is sad and funny and touching -- "Can't We Talk About Something More Pleasant?" "Over Easy" and "Thrilling Adventures. . ." are both now on hold at the library, though for the latter I will have to wait in line. "Secrets of the Powder Room" isn't available at library at all. Boo. I loved the Roz Chast book. Ah, I love Hugh's veg book. Main reason are 1. I am English and therefore required by law to view him as a national treasure and 2. I have given up trying to cook the same food for my family more than twice a week so sometimes get to cook exactly what pleases me. And there are many recipes in this that please me. I do know exactly what you mean about the carrot humous though - amazing on Day 1, and this is also true of the beetroot humous but you end up with far too much and by Day 3 you just can't face anymore. I have been reading your blog for years now, I love it. Sometimes I end up with a couple of months to catch up on - like this week. 2015 has been so up and down this year, I had not been keeping up with you. But I have parents and sister coming for dinner tomorrow and wanted to cook something lovely. I have been looking through to see what you have found lovely as inspiration - I need to go back to your Yottam recipes. I too was unimpressed with Plenty More which my first book of his, but your write ups after readers comments looked great. Anyway, in summary - your blog is great. Thank you!! I laughed. So I guess it means I should check this book out. My kid will barely eat corn, so the Veg book is out. I am a big George Orwell fan, although fan is probably not the correct word. I always think his writing is so depressing. Have you read Down and Out in Paris and London? Probably a lot like his experiences in Burma. I have to say that 1984 and Animal Farm had an enormous influence on my thinking about people and politics. I honestly can't read a single thing by or about Republicans without thinking about 1984, and with respect to Animal Farm I often think that I probably am a Socialist and love the idea except for the fact that a Socialist system is run by, you know, people, so it's never going to work. I think he knew that too. 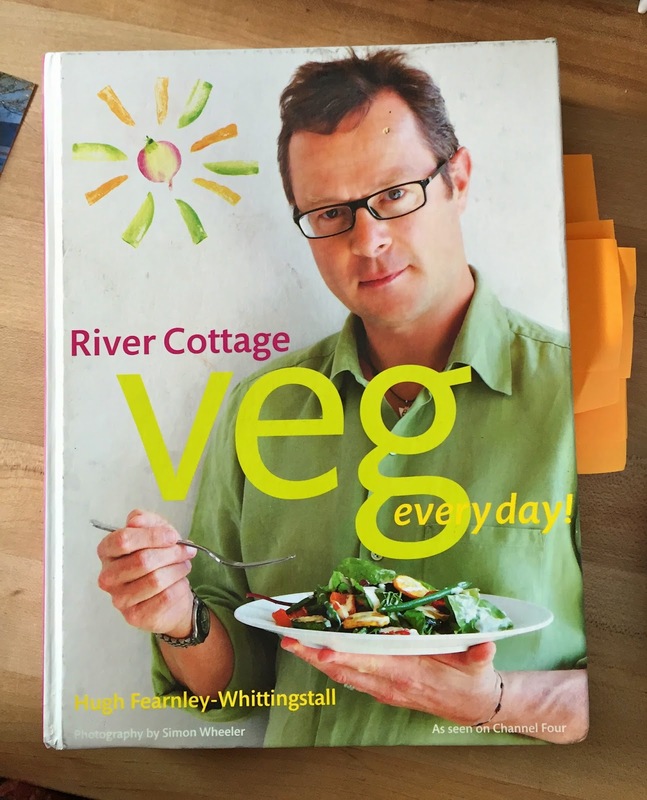 I am an unadulterated fan of Hugh Fearnsley Whittingstall and I love his Veg book. I also adore his Light and Easy cookbook. Everything is simple, delicious, and often quick. Everyone has raved about the recipes. But 'everyone' doesn't, admittedly, include anyone under 27 since it's just me and my boyfriend eating.